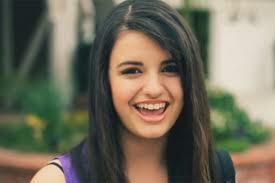 We've all heard Rebecca Black sing and we have all ridiculed her no bounds. But if you carefully listen to each and every verse of that song you'll know it's more than just a routine song. There's more to that angelic face. There's more to that innocent smile. My findings after profusely listening to Rebecca. It's a painful cry. You can literally feel the pain in here. Most of you must have switched off the TV and started gasping for breath by now. It's horrifying already and only the courageous carry on. But I still can't comprehend what that pain is about. That voice, I know when one sounds like that, it's when you get constipated and I think my conviction is true in here because of the painful cry initially and there's too much "gotta" in the above verses. Is she referring to "Jamal Gotta"? Does she have Indian roots? How on earth does she know about Jamal Gotta? What is she trying to convey? Or wait, Gotta could be an imaginary friend, "Gotta, have my bowl. Gotta have cereal, Gotta get down to the bus stop". Good lord! The kid is possessed. God, she is brilliant already. Does she have RLS (Restless Leg Syndrome)? Kicking in the front seat from the back seat has to be involuntary of course. Plus she wants to make up her mind whether she would love sitting in the back seat or kick the front seat. There is something wrong with this Kid. And oh, there's Gotta again. It's FRIDAY. Something is not right, Gotta will get down on Friday and will wait for the weekend. The girl seems to have no feelings at all, she is as numb as a dumb cow. She has just one expression as she says "Friday, Friday", with her nodding head. What are you going through kid? Wish I could know. The girl here is sufferring from "I-Can't-Say-G-at-the-end-of-a-word" syndrome as she waits for the weekend and says manuevering marvelously with her expressionless expressions. She is troubled and suffering. Watch her as she says..."Fun, fun, fun, fun"...it resonates like a gong in your ears. It's sadistic fun that she calls for. She is out on a prowl and it's only 7:45. She mentions about a friend with her on her right, quite skillfully she hasn't mentioned anything about it. And with that scary monotone she is still kicking around for some reason from the back seat on the front seat. Moreover, Gotta is still around. This is already a well crafted song. Why on earth would a 14 year old try to memorize days of the week and want a ball? Or she reminding us about a weekend where she and her friend is going to create havoc? I feel bad for this kid as she stammers (i-is, we-we) with that monotone and still cribs about the weekend and yes the "I-Can't-Say-G-at-the-end-of-a-word" syndrome still haunts her. Sigh. Now she has an accomplice too (where on earth did he come from?). Plus if you have a good look, that guy looks more like an Indian rather than a Black American. Is he, what I think he is. Is he Gotta? Plus these melee of lines...I just can't understand. It sounds like English, it just isn't. He says he is passing by a school bus that goes "tick-tock". What kind of a school bus is that? Where are you from Gotta? I believe this is the best I could do now. I can't comprehend what this song is about but I think I have my own conclusions for this beautiful blend of emotionless emotions created by Miss Black. So Rebecca Black is a possessed girl, suffering from constipation, Restless leg syndrome and "I-Can't-Say-G-at-the-end-of-a-word" syndrome. She has an imaginary Wannabe Cool, Marathi friend named "Gotya" who can rap too but British accent makes it "Gotta". They both are set to make your weekends dark. My friend Siddharth Deshpande had once mentioned about a research wherein a Cat's poo supposedly contained a parasite that controlled people's brain and their behaviour, this song is as deadly as that parasite. It sticks in your head. P.P.P.S: She only blinked 7 times in the entire video. haha!! Read that already. Nothing beats Rebecca though. Just saw the song for the first time....man this one beats both himesh reshemiyaa and Justine briber in a handicapped match !